In June, the Brewers Association announced its “Independent Craft” seal—a graphic meant to distinguish the 5,562 breweries that fit its definition of craft beer from those owned by the big bad corporations. In its announcement, the association cited a new Nielsen survey that found that 81 percent of regular craft beer drinkers chose “independent” and “independently owned” as their most familiar beer terms. Three days later, Anheuser-Busch InBev responded with a video featuring the president of its craft division, The High End, and founders of five breweries it bought in the past five years. Each founder gave his own spin on why the Independent Craft seal was counterproductive. They argued what matters most is if beer is tasty enough to make it more desirable than wine or cocktails. Walt Dickinson, founder of Asheville, North Carolina’s Wicked Weed, likened the wine and spirits industries to an “armada of boats… coming across the Atlantic to crush us.” He described a “civil war” between breweries being fought with crude instruments like muskets and slingshots. Dickinson’s strategy? “Good product wins,” says the man who likely made millions when he sold his brewery to AB InBev less than two months before this video was made. The first craft brewery I remember admiring was New Glarus Brewing Company in Wisconsin. The husband-and-wife founders make beers they want to make and won’t sell them anywhere outside their home state. New Glarus president Deb Carey was one of the first women to found a brewery in the United States. She’s taken progressive stances on issues like healthcare that haven’t always proven popular in Paul Ryan’s backyard. But based on the massive expansion they announced this month, New Glarus seems more popular than ever. A few weeks ago I met Felipe Szpigel, the president of The High End, along with a few of the founders of High End breweries at an event in Chicago. We sampled beers from Wicked Weed, Elysian, and Blue Point. All were “good product,” no doubt because the brewery founders had dedicated years to building something from the ground up. They had strong opinions about the best brewing methods and passion for getting more people to drink beer. But to a small but vocal percentage of beer fans, these men were sellouts, turncoats who’d abandoned the cause of craft beer for a big payday. The issue gets complicated when one looks closer. Some employees say being acquired by a larger brewery brings greater safety and better benefits and pay for employees. And those good jobs certainly have a positive impact on local economies. But in many cases those jobs were created as the brewery built a loyal customer base from nothing. This intangible goodwill and authenticity is bundled in with the physical factories AB InBev buys when it purchases another brewery. As the biggest brewing company in the world, AB InBev could build identical physical factories for less than it’s paying for adding breweries to The High End. The thing it can’t buy is the notion of authenticity. Instead of creating more new beer brands like Shock Top, AB InBev now buys beloved breweries and hopes the goodwill and street cred carries over. One way it hedges this bet is by not indicating the corporate owner on any High End products (for the record, this includes Goose Island, Blue Point, 10 Barrel, Elysian, Golden Road, Four Peaks, Breckenridge, Devils Backbone, Karbach, and Wicked Weed). I want to support breweries that aim for more than good product. Whether it’s breaking glass ceilings at New Glarus or putting sustainable energy before the bottom line at New Belgium, I’m interested in beer that makes me believe that another world is possible. That said, here are four pineapple beers, one coconut beer, and a sour from breweries both independent and not that I think you should try this month. An early entry into the pineapple beer category, Pineapple Sculpin has been delighting taste buds for more than two years. Was this beer the one that convinced Constellation Brands to buy Ballast Point for $1 billion in November 2015? Who knows? But one can imagine a board room of executives getting swept up in the sweet, sticky pineapple aroma and writing a check before they finished tasting the juicy, pithy bitterness of the aftertaste. Try it—you’ll feel like a billion bucks. A beautiful beer that lives up to its name (literally “sour pineapple” in Spanish), this one is not for fruit fans as much as sour sippers. Again, a sweet pineapple aroma precedes an intense flavor experience. This time the tart and sour aspects of the fruit’s flavor are expanded, edging out bitterness and sweetness both but leaving the smallest bit of room for a few funky flavors familiar to sour beer drinkers. A Chicago-area favorite, Greenwood Beach has a little something for everyone in this blonde ale. There’s the bready, middle-of-the-road beer flavor that makes blondes crowd-pleasers in the first place. There’s a whiff of hops that keeps things current. But over that is a hefty layer of pineapple, smeared like jam on everything. The low ABV (alcohol by volume) keeps everything breezy, like a late-summer beer should. I lost track of this small Belgian-style brewery from Michigan these past few years, until a friend gave me a can of this nectar. I don’t mean nectar of the gods in a metaphorical way. This tastes like Vivant’s trademark strong saison with mango and pineapple nectar added. And that is a good thing. If radlers (a traditional German combination of beer with grapefruit juice) are acceptable for beer drinkers, this slightly less effervescent style should be allowed and embraced. One of the standard bearers of the independent craft movement, Dogfish Head is also a big enough brewer that it’s able to buy up the majority of this experimental coconut-smelling hop for “years to come” (and send me this bottle to sample). Combining this hop with coconut water and toasted coconut flakes yields a cohesive IPA playing in a different field of flavors than most. Unlike many coconut beers, the fruit doesn’t taste like an obvious addition or get lost behind stronger flavors. If anyone thought being owned completely by Heineken would’ve dampened Lagunitas’ weirdo spirit, they need only look to the Dark Swan, a “hybrid ale” soured with lactobacillus, for a counter example. (See also its purchase of 50 percent of Moonlight Brewing, the legendary Northern California brewpub that’s never bottled its beer since opening in 1992, only selling draft kegs.) Petite sirah grapes make this sour look like heady red wine in the glass, and of course, there are tons of hops added because it’s Lagunitas, making the whole thing a unique experience indeed. 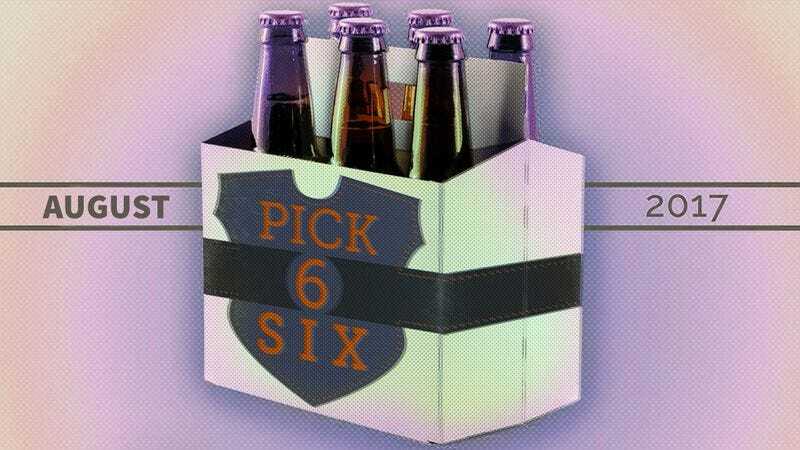 If you have a brew you’d like considered for Pick Six, send us an email at avclubbeer@gmail.com.